The excellent AFV Club Churchill Mk.IV AVRE (Armoured Vehicle Royal Engineers) with the Resicast SBG (Small Box Girder) Assault Bridge. The hull of the Churchill is packed full of ballast to counter the weight of the bridge. 17 responses to Churchill AVRE with SBG Assault Bridge. 1/35. Well, that’s impressive. Love these oddball suppprt vehicle projects. Thanks Rob, I’ve got a few of these type vehicles in the stash, going to start work on a Sherman BARV soon. COOL. Very hot setup. How about some detail shots of the mechanism? Sure thing Bill, give me a couple of days and I’ll see what I can come up with. Incredible build, a vehicle like this will be surely the center point of the vehicle collection. 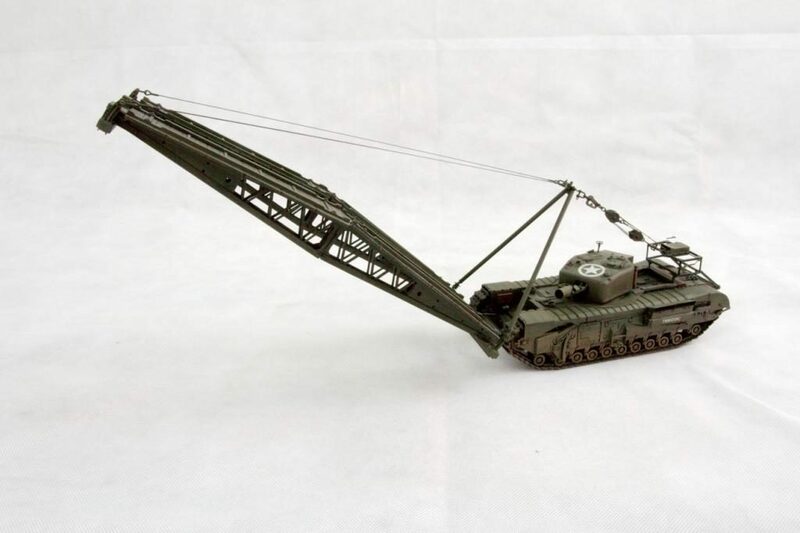 I think AFV Club is underrated in the scene, especially their Churchill kits are second to none. The running gear with the springs is outstanding. Tamiya is may more easy to build. Thanks Bernd, I have previously built their Centurion and a couple of their artillery kits, and I have three more Churchills in the stash, all excellent kits. This one is very impressive. 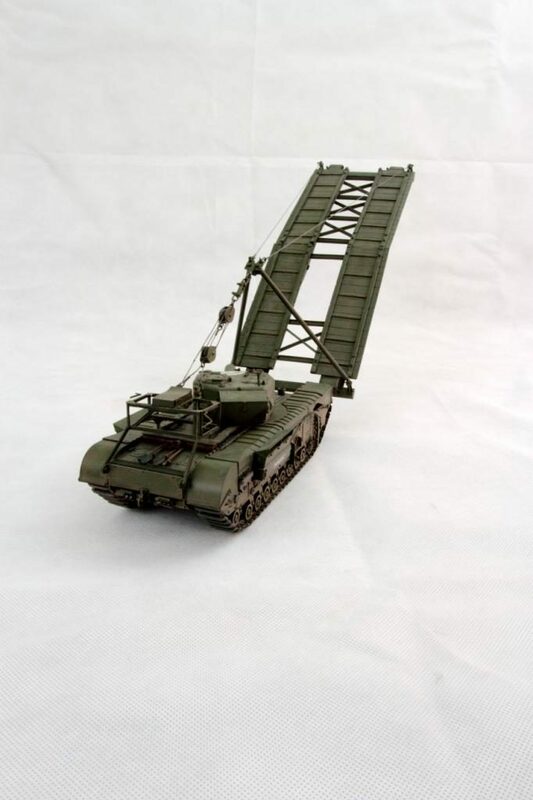 Years ago I was toying around with the idea of scratch building a M-60 AVLB. Hmmmmmmmm. Now you got me thinking again. Awesome build !!!! Excellent job, again an unusual subject. 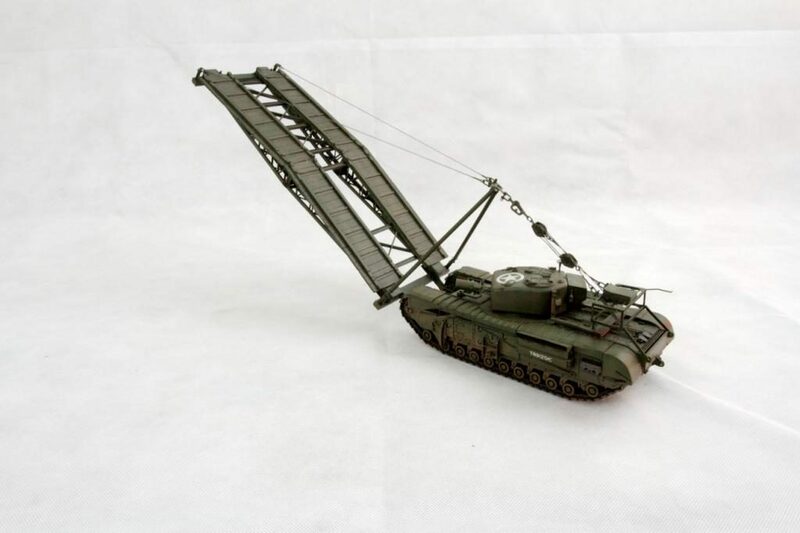 I think Revell put out an ancient M-48 scissor bridge? Thanks Robert, don’t know about Revell, but Trumpeter do a German WWII bridge layer based on a Pz IV. Very nice indeed….don’t think I’ve seen one modeled before. I like it. Good work Bernard, it looks very interesting. Terrific subject and a great model – well done!